I love Pico de Gallo, especially in the summer with tomatoes from the garden. So fresh. And seems to lighten everything up. I love it, I do something almost like this. I love salsa! This looks so fresh & delicious! Pingback: Dragonfruit Mock Mojito Recipe - Frugal Mom Eh! This looks delicious, I’ve got to try it! Thanks for the recipe! I love pico so much more than salsa. Fresher. I have never made it. Only purchased in deli. Thanks for the recipe. I will try to make it myself this summer. I’ll have to try this recipe. It would be good at family BBQ’s. It would be even better with fresh tomatoes from the garden. Yummy! this looks sooooo delicious!! totally know what im feeling like tonight ! 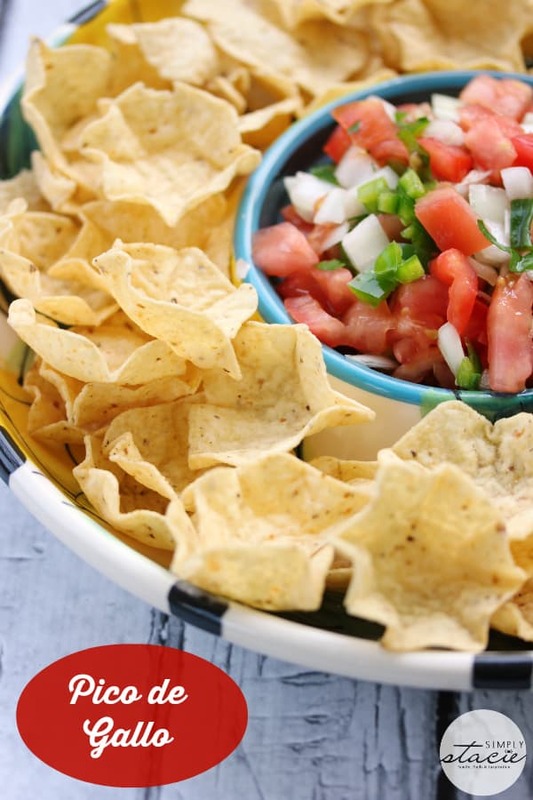 oh yummy, nothing beats a homemade salsa, this dish looks so good and refreshing, it’s one my hubby would also like too, thanks for sharing yet another great dish!! Thanks so much this sounds amazing i will be making this for sure. THANKS! I’ve been looking for a recipe like this – thank you! Making it at home is so much better than buying a jar of salsa! This looks so good! I love salsa and this looks great. Want to give it a try soon! I love how they’re shaped like bowls! Oh my addiction to nachos. My family does not celebrate Cinco de Mayo but this Pico de Gallo looks delicious and I would love to try it. Thank you for sharing this recipe. Thanks for posting this. I buy this, but I’ve never made my own, which makes no sense since I have a garden every year. I’m going to have to give it a try! 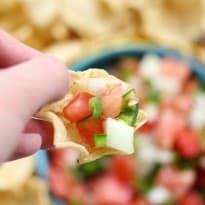 Love pico de gallo sauce but have not tried to make it. Thanks! Right now that I’m prego I crave salsa. Thank you for the recipe! I’ve never heard of Cinco De Mayo before, so that was interesting. I’m afraid I don’t like spicy food so this isn’t for me. Yum! Looks so good. I think I might make this tonight after grocery shopping. Hope I can find serrano chili peppers easily! How easy and delicious! This will really be marvelous with homegrown veggies. I love pico and I’m always asking for extra. It would be nice to make my own at home. I often prefer pico to salsa because it is fresher and has larger pieces but either is good all year , not just now. This looks so fresh and delicious. Perfect for a Cinco de Mayo party! (pico de gallo) I have made this before for my family, I did cut down the amount of jalapeno peppers in it though. I do not like things that are too spicy & hot, I’m a light weight when it comes to that. Pico de Gallo is so yummy. I love to eat it with my chicken fajita’s. It gives it a light and refreshing taste. This sounds great! Do you ever salt it or is it good on its own? I like it on its own but you could definitely add salt if you like. 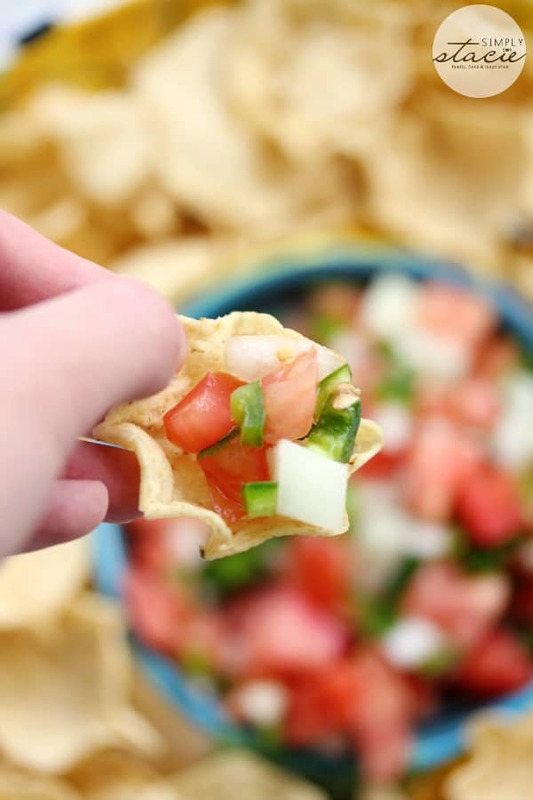 I love fresh pico de gallo, nothing better imo…maybe with guac too 😉 Gorgeous pictures Stacie! 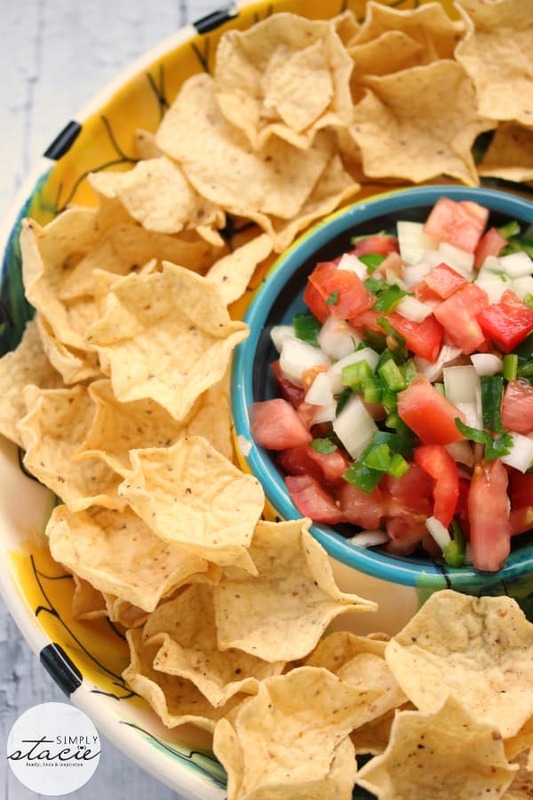 Love Pico de Gallo, and this looks like a great recipe. Love that it is made with fresh ingredients, much better than store bought! I’ll have to try this one! This looks so refreshingly delicious.I love tomatoes,onions and peppers in salsa dips & I love when it’s been just made fresh. That looks great! I’m going to make it tonight! I live real close to a store so it will be easy to do! Love the look of this wonderful salsa and chips! Thanks for the post and I will defintiley be making this today! This recipe is so easy to make, especially for Cinco de Mayo. My daughter loves this. Happy Cinco De Mayo! Thanks for the Pico De Gallo recipe, Stacie! Yum looks good, Happy Cinco de Mayo! Sounds and looks delicious I will have to try and make this. Mmmm.. I always wanted to try making my own pico de gallo. This looks delicious. It would have been perfect to put on top of the chicken and cheese enchilladas I made last night! Mmm…my mouth is watering. I love Mexican food and this has the bonus of being vegan! Yum, I love Mexican foods, they’re among my top favorites! This sounds so good! What a great summer snack! I love Pico De gallo. I never made my own but this recipe sounds delicious.